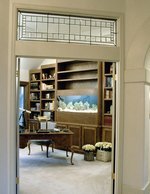 Making sure your fish have a healthy environment to live in is essential to their well-being. 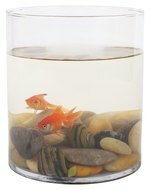 Over time, waste products will accumulate in your aquarium, causing decreased water quality that may cause health problems for your fish. Aquarium filters like the mini Aqua One Low Voltage Internal Filter can be submersed in your tank to filter out waste products and to deliver clean water back into the tank. Setting up a mini Aqua One filter pump is very easy and, combined with regular water changes, it can greatly improve the living conditions for your fish. Attach your mini Aqua One filter pump on the top inside wall of your aquarium, using the suction cups on the back of the filter. Place your pump near the top of your aquarium, where it won't make contact with substrate on the floor of your tank. Push the upright adapter into the pump outlet adapter. The upright adapter is the plastic device that plugs into the pump outlet at the bottom, hooks onto the top of the filter and has an opening at the top to attach additional outlets like the duckbill or spray bar. The pump outlet adapter is the opening located near the middle of your filter. Insert the smaller end of the pump outlet into the pump outlet adapter of your choice. The 9mm and 13mm outlets deliver filtered water directly back into your tank. Push the duckbill into the outlet at the top of the pump outlet adapter, and position the spout so filtered water flows out along the tank's surface. If you are using the spray bar instead, push the spray bar elbow into the pump outlet, and attach the spray bar to the spray bar elbow so that it is suspended over the surface of the water. Slide the flow adjuster on the front of your filter to increase or decrease the flow of water from your filter. Slide the bar to the left, toward the plus sign, to increase flow; slide the bar to the right to decrease flow. Fill your aquarium, and plug your mini Aqua One filter pump into a nearby wall outlet.